Training Siberian Huskies may seem like a daunting task at first, especially if you are inexperienced with handling this breed. In order to effectively train them, you must first understand how they think and what you have to do in order for them to obey you. After you understand how Huskies think, you should focus on alpha leadership training. In order to effectively display alpha leadership, there are a number of things that you should or should not do, which will be discussed at the end. Training Siberian Huskies properly really requires an understanding of what goes on inside their minds. Some people assume that Huskies are not very intelligent because they are often disobedient or are just plain difficult to train. This assumption is far from the truth – they are actually very intelligent dogs, but are extremely stubborn and independent; these dogs have a mind of their own! They often do understand what you want them to do, but whether they want to do it is another story. Therefore, they need a confident and strong-willed owner to be their “leader.” Huskies are very pack-oriented animals, since they were bred to be sled dogs. This means that you need to establish yourself as alpha of the pack in order to effectively train them. Without a leader, they will attempt to take charge and that almost always leads to undesirable behaviour. It’s important to understand that dogs do not think like humans – they think like dogs. This statement may seem blatantly obvious, but many owners fail to realize that dogs have a completely different understanding of the world than humans do. All dogs need to have a leader to feel safe and happy. Because they are descendants of wolves, which form very strong pack hierarchies, it should be no surprise that domesticated dogs also share this same requirement. If dogs are not given a clear understanding of where they are in the hierarchy, they become anxious and will try to fix that problem themselves – by trying to dominate you. For that reason, many owners are surprised when their dog, who’s usually affectionate, suddenly growls at them when he is told to move over on the couch. Another common scenario is when a dog growls if his toy is taken away from him. Such behaviours stem from dogs trying to test their dominance over you. If you want to have success in training Siberian Huskies and be free from behavioural problems, then alpha training is a must. 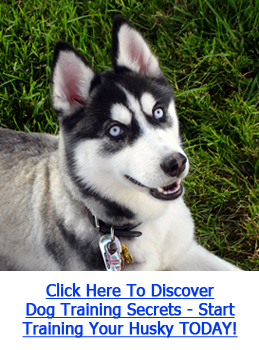 Click Here To Discover Dog Training Secrets – Start Training Your Husky TODAY! There are many things you can do to show that you are the alpha when it comes to interacting with your Husky. •	If you want to give attention or petting, call him over to you, rather than going up to him. These are just a few of the tips to get you started on how you can display alpha leadership to your Husky. For more detailed information on alpha dog training, a highly recommended resource is Secrets to Dog Training.